Here are the rules for getting your tree into the mulcher -- not the landfill -- after the holiday season. For all jurisdictions, the tree must be free of all decorations. In D.C., Christmas trees will be picked up for recycling for the first two weeks of January. Put your tree on the curb by 7 a.m. on Saturday, January 12th. If you live in Fairfax County and have country trash service, put your tree on the curb on your trash day during the first two weeks in January. If you use a private trash service, call your company for instructions. 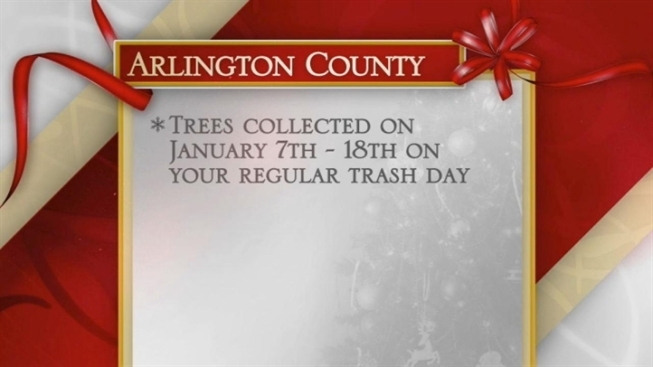 In Arlington County, trees will be picked up starting January 7th through January 18th on your regular trash collection day. Loudoun County offers five locations for residents to drop off Christmas trees for recycling through January 17th. Those locations are: the Loudoun County Landfill in Leesburg, the Lovettsville Game Protective Association, Franklin Park in Purcellville, the South Riding Town Hall and Claude Moore Park in Sterling. If you live in Prince William County, take your greenery anytime to: the Price William County Compost Facility in Manassas, NOVEC in Gainesville or the Prince William County Landfill in Manassas. The Leesylvania State Park in Woodbridge will also take greenery up until Friday, January 11th. January 14th and then 21st. Pick up is curb side only. Put your tree out there by 7 a.m.
Montgomery County will recycle Christmas trees until Friday, February 1st. Put your tree at the curb by 7 a.m. on your recycling collection day. In Prince Georges County, residents should place trees curbside before 6:30 a.m. on regularly scheduled collection days by Friday, February 1st. You can also bring your tree to the County Yard Waste Composting Facility or to the Brown Station Road Public Convenience Center.